The JSS is a joint USAF/FAA radar use program. The ACC portion of the JSS is composed of four CONUS SOCCs equipped with FYQ-93 computers, and forty-seven ground-based FPS-93 Search Radars. FAA equipment is a mixture of Air Route Surveillance Radar (ARSR) 1, 2, and 3 systems. Collocated with the majority of radar sites are UHF ground-air-ground (G/A/G) transmitter/receiver (GATR) facilities. Fourteen sites have VHF radios as well. The GATR facility provides radio access to fighters and AWACS aircraft from the SOCCs. 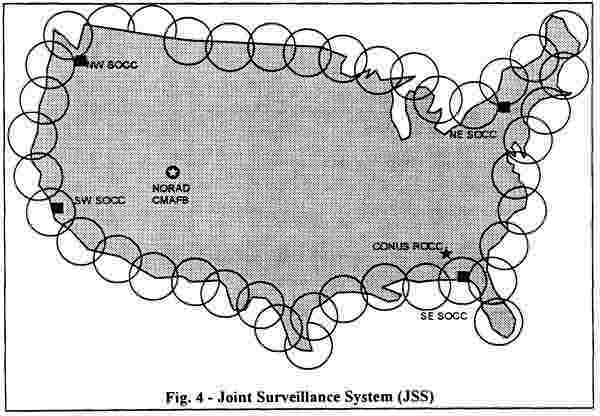 The JSS radars send surveillance data to the SOCCs who then forward tracks of interest to the CONUS ROCC and NORAD. Radar and track data are sent through landlines as TADIL-B data and through HF radio links as TADIL-A data. Both TADIL links are provided by the Radar Data Information Link (RADIL). CONUS SOCCs communicate with the CONUS ROCC and NORAD by voice and data landline circuits. The FAA/AF Radar Replacements (FARR) program is the CONUS JSS upgrade program. Forty-two FAA radars (ARSR-4 three-dimensional long-range radars) will replace older JSS two-dimensional surveillance and height finder radars with modem, more reliable systems. A replacement system is being planned for the aging AN/FYQ-93 SOCC computers.